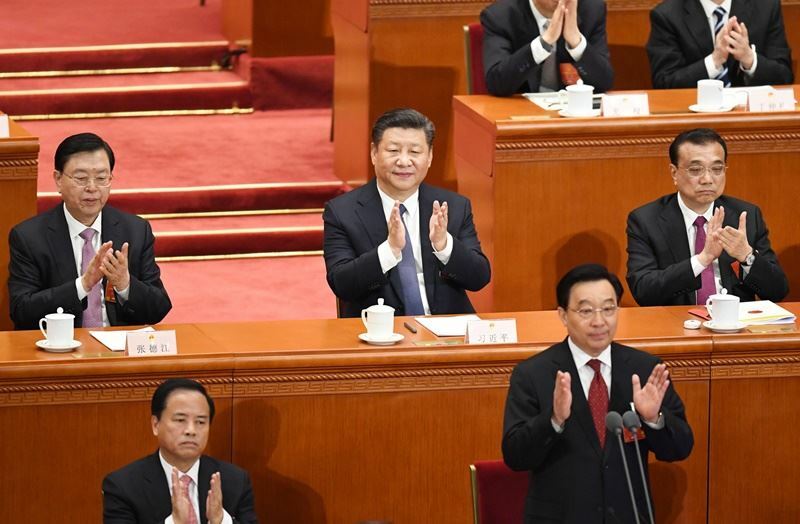 In a historic move, China's National People's Congress on March 12 approved constitutional changes to remove presidential term limits set on its leaders, allowing Chinese President Xi Jinping (習近平) to remain the country's president indefinitely. Almost all local experts agree on one thing: The move has solidified Xi's position as the supreme leader of China and the country is moving toward a one-man-rule administration. But they have differing views on how Xi's consolidation of power will impact Taiwan. Some, like Kao Koong-lian (高孔廉), a former acting chairman of the Mainland Affairs Council (MAC), have argued that the change is a blessing in disguise for Taiwan. During a March 12 radio interview, Kao said that with the scrapping of presidential term limits, Xi will have more time to deal with Taiwan instead of feeling pressured to fix the issue by 2023, when his term in office would otherwise have ended. "This change has also allowed Taiwan to heave a sigh of relief," he said. But Taiwan's top intelligence chief is not that optimistic. Commenting on the issue during a March 19 legislative session, National Security Bureau (NSB) chief Peng Sheng-chu (彭勝竹) warned that China's constitutional changes will in fact result in greater pressure on Taiwan. "The more power Xi has right now, the more pressure he will put on Taiwan," Peng said while fielding questions in a legislative session. In Xi's one-man-rule administration, if he decides to go harder on Taiwan, no one can stop him now, according to Peng. However, while Beijing continues to put pressure on the Taiwan government, Xi's administration is likely to step up its efforts to win the hearts and minds of the Taiwanese people, Peng said, referring to Beijing's announcement in late February of a series of incentives to lure Taiwanese nationals and businesses in sectors ranging from agriculture to movie production, allowing them to compete on an equal footing with Chinese citizens. Peng also said that the Chinese government is likely to react strongly to U.S. President Donald Trump's signing of the Taiwan Travel Act in late March. The repercussions may include China's renewed poaching of Taiwan's diplomatic allies and increased military exercises near Taiwan, according to Peng. As predicted by Peng, after Trump signed the act that promotes meetings and visits between high-ranking U.S. and Taiwanese government officials, Beijing has reacted strongly, calling on Washington to "correct its mistake." 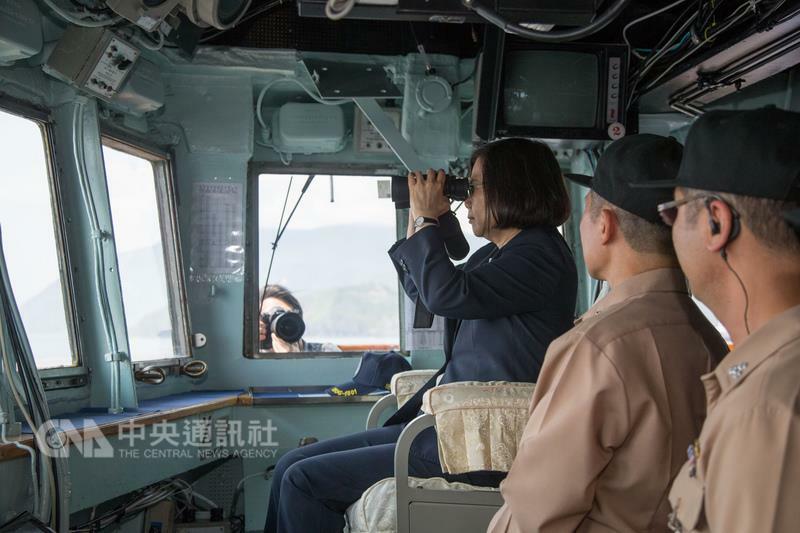 Beijing has also continued to threaten Taiwan with action by sending its aircraft and vessels to waters around the island. China's People's Liberation Army (PLA) dispatched its only aircraft carrier, the Liaoning, to enter Taiwan's Air Defense Identification Zone (ADIZ) on March 20, the first time since Jan. 16 when it had entered Taiwan's ADIZ, sailing just west of the Taiwan Strait's median line. Most recently, China held a live-fire military drill in the Taiwan Strait on April 18 that many saw as another attempt to intimidate Taiwan. Diplomatically, a bishop appointment deal between Beijing and the Vatican is expected to be sealed soon, with many saying it could solve a decades-long dispute between the two sides, leading ultimately to the Holy See forging diplomatic relations with China while ditching Taiwan. Asked to comment on the PLA's continuous military threat, Chieh Chung (揭仲), a senior assistant research fellow at the National Policy Foundation, a Taipei-based think tank, told CNA that such showing of military prowess does not mean that Beijing is eager to unify Taiwan with military force but is rather using the threat of force as an intimidation. "Unless Taiwan does something to actively declare independence, the PLA will not set it a priority on resolving the Taiwan issue by force, at least not now," Chieh said. One reason for this is fear of possible intervention by the U.S. should cross-strait conflicts break out, according to Chieh. The PLA is still no match for the U.S. military, so unless the former has built up the ability to take over Taiwan by force in a few days before the U.S. can deploy personnel, China will not declare an all-out war with Taiwan, he said. Chieh said the PLA is still beefing up its military prowess so that it can meet a preset goal set by Xi at the 19th Party Congress. In Xi's blueprint, by 2020, the PLA will have achieved basic mechanization and will have made significant progress in using information technology and elevated strategic ability. By 2035, it will have become a modernized defense and military force and by 2050, will have become a world-class military. He also agreed with Peng's prediction that even though Xi no longer has the urgency of resolving the Taiwan issue, now with no presidential term limit, the pressure Beijing is putting on Taiwan will not be relieved soon. Building pressure on Taiwan does not have to come with force, Chieh argued. It can be achieved by continuing to lure away more of Taiwan's existing 20 diplomatic allies, by isolating Taiwan from international organizations and trade pacts, and by introducing incentives to attract Taiwanese youngsters, which is exactly what Beijing is doing now, he added. One way or another, Taiwan has to come up with solutions to face the mounting pressure from China. For a start, as suggested by both former Democratic Progressive Party (DPP) Chairman Hsu Hsin-liang (許信良) and ex-National Security Council (NSC) head Su Chi (蘇起), the current administration needs to break the ice and reopen official cross-strait dialogue. Speaking during a March 18 seminar, Hsu said that China is Taiwan's biggest trading partner and Taiwan's main destination for outbound investment, with 40 percent of Taiwan's exports flowing to China, while only 10 percent goes to the U.S.
Taiwan cannot take sides between the two world superpowers. "We cannot give up either one of them, we have to gain our best interests from both China and the U.S.," Hsu stressed. Any ruling administration in Taiwan has the obligation and duty to break the ice and reopen official cross-strait dialogue, according to Hsu. Echoing Hsu's view, Su, a former secretary-general of the National Security Council (NSC) during the previous Kuomintang (KMT) administration, said that no small countries in the world will lean toward the U.S. while distancing itself from China, as Taiwan is doing now. "Why would Taiwan think the U.S. would sacrifice its own interests to protect Taiwan?" he asked. China has been catching up with the U.S. on every front over the past several years, both economically and militarily. Given the ongoing global rise of anti-democratic tendencies, it would not be smart for Taiwan to rely solely on the U.S., he said. While maintaining close relations with the U.S. and Japan, Taiwan should make sure that cross-strait relations are also maintained, which is what the former KMT government did before, according to Su.